When it comes to smart storage, using untapped spaces in your home is key. After all, closets aren’t the only places where organization can make your daily life easier — and if your square footage is limited, you may need to seek out ways to put every nook and cranny to smart use. Your stairs, believe it or not, are an ideal place for creating organization. Both over and under your steps, you likely have space that currently sits unutilized. Here are three ways to maximize this area and invent a storage solution that elevates your space. Stairs function as a means of getting from one floor of your home to another, but they can also be used as a little-known storage opportunity. The edge of the stairs against a wall is actually a perfect location for storage cubbies — especially if you don’t have a mudroom or your entryway is tight. 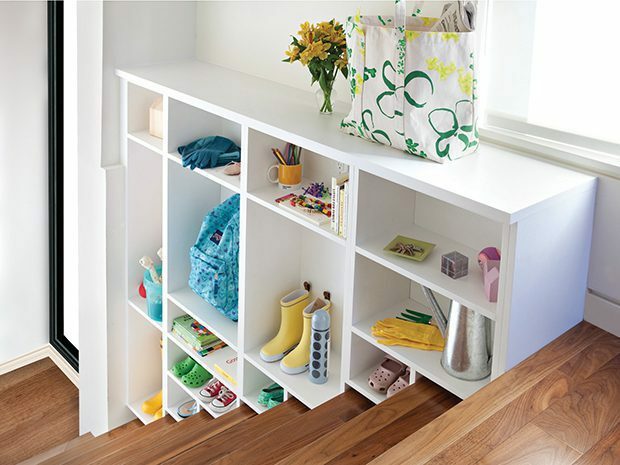 In this space, backpacks, shoes and other daily essentials can be easily organized and kept out of the way. Are you looking for the best office storage solutions? The nook underneath your stairs provides another space for storage when you transform it into an office. This often-wasted area is an ideal location for a built-in desk and other storage components, like shelving. Use closed doors or bins to conceal items you don’t want to show, and display eye-catching artwork or photos to create a functional and stylish space. Another use for under-the-stairs space is a landing station for your household. Get some space with smart entryway organization by installing cubbies, wall hooks and a bench, you can create a mock mudroom where items such as coats, shoes and mail have a home. Designating spaces for each family member provides even more order: Getting ready for school and work will be much easier when everyone’s essentials are well-organized and easy to put away at the end of each day.